F1, in more ways than one, is all about timing. The timing screens - that all in F1 are enslaved to - we know about. But it applies more broadly too, to getting your big break. For all of the effort and analysis that go into the decisions of who drives where, we've seen that strong performances and results at exactly the right moment can sway who gets the opportunities. Paul di Resta makes no secret of his desire for a team step-up, and those squads further up the grid you feel could do a lot worse (indeed, some are doing a lot worse) than throw him the keys. But just like last year, and the year before, di Resta's showing signs of letting things slip at the vital moment - at the point when contracts for the next year are being signed. Since entering F1 from the unlikely route of DTM di Resta has been impressive. He divides opinion of course, partly due to his rather stern facade out of the car, as well as his habit of criticising his team in public (though even with this, I find the hostility he gets in certain quarters - if my Twitter timeline is any barometer - frankly ridiculous). But behind the wheel consistently di Resta has displayed a Button-like smoothness and polish, with a tendency to avoid errors and bring the car home that have belied his relative inexperience. In his freshman year no one completed more racing laps than he. 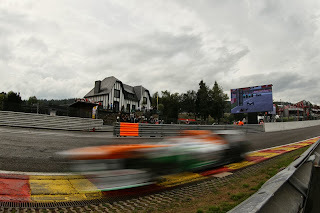 And he doesn't lack speed either, shown especially when for the first two-thirds of 2012 there was almost nothing to choose between di Resta and the highly-rated Nico Hulkenberg in their direct intra-Force India face-off. However, di Resta then endured a difficult end to 2012, wherein he went oddly off the boil in the last six races - which many seemed determined to take from that match-up and extrapolate it over the whole campaign, perhaps showing the power of recency - and his F1 career got close to choppy waters. But this year he steered things back on course, benefitting from a surprisingly competitive Force India, scoring points in seven of the first eight rounds and firmly getting the better of new/old stable mate Adrian Sutil. For a while the lack of examples of his aggression and battling wheel-to-wheel was a gap on di Resta's F1 CV, yet his spirited dice with Lewis Hamilton at Silverstone was a revelation in this (and those who'd tracked di Resta pre-F1 knew that he lacked little here). But then... after Silverstone the tyres changed of course, and there seems little doubt that the change has impeded the Force India more than most. And since for di Resta there have been no points. Worse, particularly for someone previously noteworthy for staying out of scrapes, di Resta has crashed out of each of the last two rounds with what looked like his own errors. In Monza di Resta had the mitigation of a weekend set back significantly by a brake failure-induced crash in Saturday practice. While the Singapore one was curious: di Resta couldn't work out what the error was and the team telemetry didn't offer anything obvious either in terms of carrying too much speed or of getting it wrong with the brakes (perhaps he got unlucky on a bump). But in each the end result was the same, and sadly F1 doesn't always pay heed to such nuance. 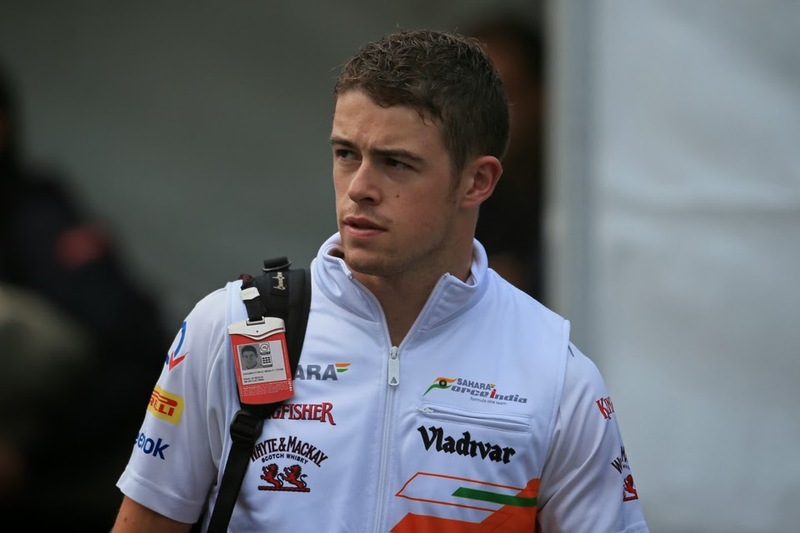 Di Resta - missing the opportunities? It's a pity too: as Singapore looked to be the race that he finally bounced back in. After starting seventeenth di Resta somehow got to lap 20 on the set of supersofts that he started with, on a day that most swapped between laps 11 and 15 (even Vettel only made it to lap 17). And he was still quick, holding off Alonso for many laps and hardly being caught by Webber. This vaulted di Resta right into the mix, and while the safety car didn't really favour him he stayed in the fight until his late excursion spoiled it all. 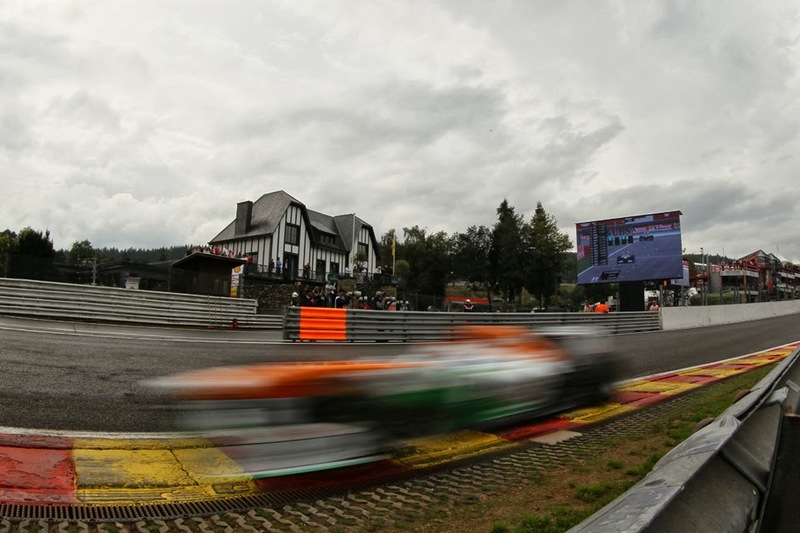 The Force India team reckon di Resta would have finished sixth had he made it to the end. For di Resta there is the awful sense that history is repeating: of those teams above Force India in the pecking order Hulkenberg and others seem ahead in the race for a Lotus gig, the other line ups are done or look nearly done. Just like 12 months ago the sought after seats seem to be evaporating all around him rather rapidly. And most broadly there is the risk - as plenty of drivers past could tell you - that the longer you linger in the midfield, the harder it is to escape it. Di Resta as far I'm concerned hasn't done anything so far to warrant going to a bigger team. He was beaten by Sutil in 2011, in 2012 he matched Hulkenberg for the first half of the season, but as previously highlighted in an article by James Allen, Hulkenberg took a few races to get on the pace after a season out and after he did Di Resta could not match him hence the end of season results. He blames the team constantly when something goes wrong, which shows he cannot lead the team, proved by blaming the team for wrong tyre calls in qualifying when a team leader would tell the team what tyres he wants and when. He crashed in Singapore and it appears to have been his error, other drivers would of just owned up to this but from the start he blamed the car, a bad workman blames his tools. Di Resta also just comes across as desperate, linking his name as any opportunity to go to Ferrari and other teams, if he was regarded as a future champion by any of them he would of already been picked up by them. The UK media needs to stop hyping up British drivers all the time unless they do something to just justify it. Hmmm - what did I say about Paul di Resta getting ridiculous hostility? 'Di Resta as far I'm concerned hasn't done anything so far to warrant going to a bigger team' - Less than Ricciardo has? Or Perez? Or Grosjean? Or, based on recent seasons, Massa? (Or indeed Massa before he got his step-up to the Ferrari race seat?). I make no claim that di Resta is an Alonso, but I see no reason why he couldn't aspire to do a similar job to that Webber has at Red Bull, or at a stretch to Button at McLaren. 'He was beaten by Sutil in 2011' - True, Sutil out-scored him, but by common consensus di Resta was the more impressive over the season (and clearly Force India agreed given they retained di Resta over Sutil for 2012). The outscoring owed a lot to the fact that Sutil was in much better form when the car got good late in the year and big points hauls were available. As I intimated in my article, di Resta's form did tail off at the end of that season. 'In 2012 he matched Hulkenberg for the first half of the season, but as previously highlighted in an article by James Allen, Hulkenberg took a few races to get on the pace after a season out and after he did Di Resta could not match him hence the end of season results' - Um, I said first 'two-thirds'? It was really only Suzuka onwards when Hulk got on top, when di Resta's form, for whatever reason, tailed off disastrously. And I know that di Resta was really on top of Hulk in the early rounds of the year, but there then followed a middle part of the year wherein there was very little to choose between them - which is what I was referring to. And it's odd that you and others seem so keen to dismiss the spell wherein di Resta did well but are equally keen to talk of the spell later in the year wherein he did badly like it's an irrefutable gauge of his potential. It's hard to have it both ways. 'He blames the team constantly when something goes wrong...' - I know this, I referred to this in my article. It's a definite flaw - win as a team, lose as a team and all that. But still, by your premise Nigel Mansell 'cannot lead the team', as he used to slag off his team in public about five times before breakfast. 'A team leader would tell the team what tyres he wants and when' - Like di Resta did in Spa you mean wherein he went against his team's advice on which tyres to go on for Q3, and it damn near got him pole? 'He crashed in Singapore and it appears to have been his error...his but from the start he blamed the car, a bad workman blames his tools' - As I said in my article the team's telemetry didn't indicate a driver error either, so the data at least is consistent with what di Resta is claiming. 'other drivers would of just owned up' - Yes, F1 drivers are known for owning up readily to faults. That was sarcasm, by the way. 'Di Resta also just comes across as desperate, linking his name as any opportunity to go to Ferrari and other teams' - The link with Ferrari (and with other teams) wasn't one way, apparently Ferrari had a genuine interest. Plus di Resta wasn't the only one to link him with the Scuderia, Jackie Stewart did too. 'If he was regarded as a future champion by any of them he would of already been picked up by them' - I'm not sure where you get the idea that it's quite as simple as that. And di Resta's been unlucky: last year he was a genuine front-runner for McLaren and Mercedes drives: Lewis moving to Merc necessarily ruled di Resta out of that drive, while with McLaren Martin Whitmarsh admitted that there were commercial considerations for going for Perez over di Resta, i.e. they'd exhausted the commercial potential of the 'British national team' brand. 'The UK media needs to stop hyping up British drivers all the time unless they do something to just justify it.' - I'm glad that you mentioned this one, as I've heard it before on occasion and it *really* confuses me. I don't know where some get the idea that the UK media particularly hypes up Paul di Resta, either in absolute terms or indeed in proportion to his talent. I struggle to think of reams of coverage that he gets from the UK media, or of them giving undeserved or hagiographic assessments of his talent. I can't help but think that this exists only inside certain people's heads, in that they assume that because he's British he must therefore be undeservedly hyped by the British media. One doesn't necessarily follow the other. And, for what it's worth, in F1 I don't care a jot for nationalities. Never have. Graham Bravo!. I too am sick of people jumping on the "I hate Di resta" bandwagon. I also read that Di resta dip in form in the latter half of 2012 was due to a damaged chassis that went unnoticed after a crash in practice. People never seem to remember his stalwart drives like Bahrain, Singapore, Canada 2014 or Silverstone 2013.